Avril Ormsby, writing for Reuters (click on title to this post to read), reports that the Roman Catholic Archbishop of Westminster, Vincent Nichols, has stated that, "Nothing is envisaged in this provision that the Pope has put in place is a kind of minimalist approach to picking bits of the Catholic faith that I like and then seeing myself as it were contained as a quasi-Catholic, not a real Catholic, under the umbrella of this constitution." The archbishop notes that a "buffet approach" to the Faith will not be acceptable. It therefore must be a positive desire in their heart, and one that centres around not questions of the ordination of women to the episcopate, not questions of sexual ethics, but must centre around an understanding of the role of the office of the Bishop of Rome…in the ongoing life of a Christian. RWF resumes: I, for one, am glad that the Archbishop has pointed this out. One really ought to make a change of this magnitude because one is drawn by the firm, positive conviction that Rome possesses the Truth in a way that Anglicanism simply does not. It should be a movement toward the fullness of Faith, not merely a journey away from a few particular flaws that the convert finds unacceptable in the Anglican tradition. 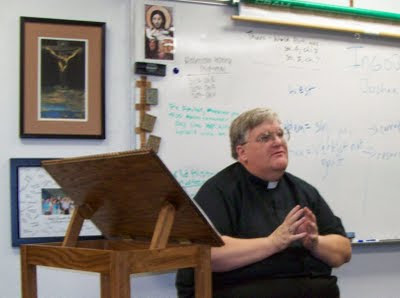 Unless the prospective convert truly is convinced in his or her heart and mind that all that the Roman Catholic Church teaches is true (including Apostolicae Curae's teaching on the invalidity of Anglican orders and their Catechism's affirmations on Papal infallibility, the Immaculate Conception, and the universal ordinary jurisdiction of the bishop of Rome, among others), I would urge them to pause and reflect deeply before moving forward. That noble Church deserves a membership devoted to the truths of the Faith as it has consistently presented them. By clicking the title to this blog entry you may read The Manhattan Declaration. This document was released yesterday and is an important ecumenical statement by orthodox Christian leaders from many denominational traditions regarding issues related to the sanctity of life, Scriptural and traditional teachings on human sexuality, and troubling recent developments in the law regarding freedom of religion. Among the initial signatories are Archbishop Robert Duncan of the Anglican Church in North America and several other bishops of the new province, along with Dr. J.I. Packer, our best known theologian. Others signatories include several Roman Catholic archbishops and the R.C. apologist Dr. Peter Kreeft of Boston College, Metropolitan Jonah of the OCA and numerous other Orthodox leaders, and dozens of well-known evangelical figures (e.g., Chuck Colson, Joni Erickson Tada, Dr. James Dobson, Dr. Richard Land of the Southern Baptist Convention, and Ravi Zacharias). More than 5000 additional individuals have signed the Declaration in the last twenty-four hours on-line. Tonight we finished up our Fall Thursday night class at St. Vincent's Cathedral. We have covered the Apostolic Fathers over the last ten weeks, and it was a great deal of fun. Thanks to all who participated. My next Thursday night class will begin after the Christmas holiday on the evening following the feast of Epiphany. The new class will focus on the thought of St. Augustin of Hippo, with special attention to The Confessions. This class will start on January 7th at 7:30PM in Middle School classroom 103. If you live in the DFW Metroplex, please consider joining us! The Court of Appeals here has issued a stay in the lawsuit the TEC-loyalist rump "diocese of Fort Worth" has filed attempting to take all our property away from the parishes of the real, ACNA-affiliated Diocese of Fort Worth. This was done because a fundamental illogic has appeared in the way TEC's lawsuit is working its way through the trial court. First, the trial court judge has already ruled that the lawyers suing on behalf of TEC's "diocese" DO NOT represent the corporation known as the Episcopal Diocese of Fort Worth that was established in 1983 and which Bishop Iker still heads. Yet the trial judge did not strike all the pleadings TEC's lawyers had filed claiming to act on behalf of the corporation at the time he ruled that they were not the real diocese's lawyers. Logically, if these TEC lawyers do not represent the real diocese that actually owns the property, then they should not be able to even appear in court to file pleadings demanding that property be handed over to the folks they represent! The appelate court has stayed any further proceedings until this fundamental illogic can be resolved. And that is GOOD news for the ACNA diocese--the real diocese of Fort Worth. The Anglican Curmudgeon has full details and is a MUST READ. Just click on the title to this blog entry to read his remarks. The New Apostolic Constitution from the Vatican on "Anglican Ordinariates"
The Vatican's new Apostolic Constitution, Anglicanorum Coetibus, has now been released (it may be seen by clicking the title to this post). And for those Anglicans who have longed for immediate, full, visible union with the See of Rome this is a generous offer. The Constitution and its supporting document make it clear that these Ordinariates will have many of the characteristics of dioceses. And for former Anglicans who are looking for the long-term preservation of some aspects of the "Anglican patrimony" inside the Roman Catholic Church this is certainly a step in the right direction. It is not clear to me precisely how much of the "Anglican patrimony" is going to be preserved with the Roman Catholic Church beyond liturgical elements, however. Paragraph III of the Constitution states, "the Ordinariate has the faculty to celebrate the Holy Eucharist and the other Sacraments, the Liturgy of the Hours and other liturgical celebrations according to the liturgical books proper to the Anglican tradition, which have been approved by the Holy See, so as to maintain the liturgical, spiritual and pastoral traditions of the Anglican Communion within the Catholic Church, as a precious gift nourishing the faith of the members of the Ordinariate and as a treasure to be shared." But aside from worship expressions informed by the traditional Books of Common Prayer, how much more of the Anglican heritage will be preserved? The new plan holds out the same possibility of married presbyters ordained out of the ranks of converted Anglican clergy that has long been provided by the "Pastoral Provision" in the U.S., of course, but certainly there is more to being Anglican than the BCP and married priests. How much more will Anglican converts take with them into the RCC? Time will tell, I suppose. But for me the crucial statement in the Constitution is paragraph I, §5: "The Catechism of the Catholic Church is the authoritative expression of the Catholic faith professed by members of the Ordinariate." This is, of course, precisely what one would expect from the Vatican. Pope Benedict and the Roman hierarchy are men of integrity who take doctrine seriously. Certainly no one would expect them to allow Anglican converts to pick and choose which elements of Rome's definitive teachings they will adhere to and which they won't. I am very glad the Constitution makes it clear that one will be accepting the entire package in taking up this offer. If you reject something the Catechism teaches you will not be in conformity with "the authoritative expression" of the Catholic faith. Period. No "cafeteria Catholicism" will be fostered by this new scheme. Bravo! Of course, if I believed the full contents of The Catechism of the Catholic Church to be true I would already have become a Roman Catholic long ago. If I were convinced that Rome's understanding of the Faith is entirely correct, I would not hold back a single minute from being received into full commuion with the bishop of Rome. I certainly would not have delayed my submission simply in hopes that one day a Pope would create an administrative apparatus expanding the Pastoral Provision and making it easier to set up Anglican Use parishes under the jurisdiction of former Anglican hierarchs as Ordinaries. Of course, personally I do not believe the Roman Catechism accurately teaches all the elements of the Catholic faith. After almost twenty years of serious study and prayerful contemplation, my own convictions are firm on certain points. I do not believe, for example, that Rome's teaching on the jurisdiction of the Papacy is correct (CCC, paras. 882-883), nor do I adhere to Rome's teaching on infallibility (CCC, paras. 889-892) or the Immaculate Conception (CCC, paras. 491-2). And there are other elements of Rome's doctrine about which I have considerable reservations. So I, for one, cannot in good conscience submit to the Roman Pontiff and avail myself of Pope Benedict's gracious offer. But I am happy for those friends who have longed for their path into full communion with the See of Peter to be made straight. May God bless your journey, dear brothers and sisters. You will be missed. When the gavel fell bringing our 27th diocesan convention to an end about an hour ago the Episcopal Diocese of Fort Worth officially became a full member of the Anglican Church of North America, ending the de facto "provisional" member status we have had in ACNA since its Inaugural Assembly last June here at St. Vincent's Cathedral. By a unanimous voice vote the convention committed us "to continued participation in the development of the Anglican Church in North America, acceding to the Constitution and Canons thereof during this process." At the same time, our diocese will also maintain "its status as a member diocese in the Province of the Southern Cone while the formal process of recognition of this new province continues in the Anglican Communion." We also unanimously expressed our "readiness to adopt the proposed Anglican Communion Covenant (Ridley Cambridge Draft)" and our "solidarity with the Provincial Council of the Anglican Church in North America and the Communion Partner Bishops in North America in the hope that individual dioceses and other churches [Covenant 4.1.5] be encouraged to adopt the Anglican Covenant." By another unanimous voice vote we also declared that we share "Metropolitan Jonah’s vision 'to live, to actualize, and to participate in the full integrity of the Catholic Church—the full integrity of Orthodox Catholicism,'" and communicated to "Metropolitan Jonah and the Orthodox Church in America [our] desire to work toward that full, visible, and sacramental unity that the Lord Jesus Christ desires in his prayer that 'they all may be one.'" Finally, we also expressed our "deep gratitude" to Pope Benedict XVI for "his willingness to achieve full communion with Anglicans" and urged members of our diocese to study prayerfully his soon-to-be-released Apostolic Constitution on reception of Anglicans into the Roman Catholic Church. The full texts of the resolutions may be found by clicking the title of this blog entry. All of these resolutions were adopted without modification by unanimous voice vote. 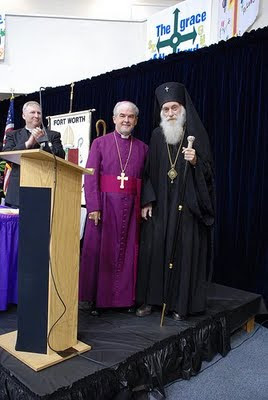 Archbishop Dimitri of the Orthodox Church of America (pictured below with Bishop Iker--photo by S. Gill) brought us fraternal greetings on behalf of Metropolitan Jonah. He was warmly received, as was the representative of the Roman Catholic diocese. How would you do in my middle school Philosophy class? I am teaching an elective "Introduction to Philosophy" class this year at St. Vincent's Middle School for our 6th through 8th graders. It is a wonderful class, full of many of my best and brightest students. The discussions are lively and frequently quite deep. Honestly, I have an eighth grader whose papers would get solid marks in freshman Philosophy at UT-Austin (well done, MNM!) and eleven-year-olds whose questions in class reflect a depth of insight uncommon for people three times their age. All of the kids are really getting into the material. I am so proud of them! Take a crack at the exam I am giving them this morning. Would you make an "A"? 7. What is the structure of the ideal society in Plato’s “Republic”? (30 points) Discuss the three different classes of people and how the government and the rearing and education of children were supposed to work.